Mamallapuram, or Mahabalipuram, is a small town located about 60 km from Chennai, the capital city of Tamilnadu state. A modern road, running parallel to the Eastern Coast, connects Mamallapuram with Chennai. On this serene route have popped up many attractions making the town a favorite weekend destination. Whatever kind of visitor you may be, rest assured that you will get mesmerized by the beauty and serenity of this small place. The religious ones come for the Sthalasayana temple, an important Vaishnava tirtha, the archaeology and history buffs come for the monuments, the beach lovers come for the serene beach and others for a casual visit, and Mamallapuram treats all with same fervor. Mamallapuram is the one among those few Indian sites which has garnered the maximum attention from the scholars and explorers alike, the others being Ajanta, Ellora and Elephanta. From the numerous references available to us, we are told that the town could be reached via ocean, or through a canal or a motor-able road. Additionally, a choice of transport was also available, be it a motor, or a bullock-cart or a ship or a boat. Since late eighteenth century, the town had been frequented by tourists, explorers and enthusiasts, reaching here thorough various modes and transports. With the convenient conveyance options and its vicinity to Chennai, Mamallapuram enjoyed the popularity of the natives and foreign travelers. An early reference calls the place ‘Seven Pagodas’. It was Gasparo Balbi, in 1590, who first referred the town as ‘Sette Pagodi de’ China’. This name was given by the early mariners who passed through the town from a distance on their voyages. Many of these mariners did not visit the place in person and most of them just had a look of it from a distance. It is assumed that the name ‘Seven Pagodas’ was given because of the seven temples, either located near the shore or visible as group from a distance. Balbi mentioned seeing eight pleasant hillocks there. Whether he took these hillocks as pagodas or he did see some temples is not very clear. 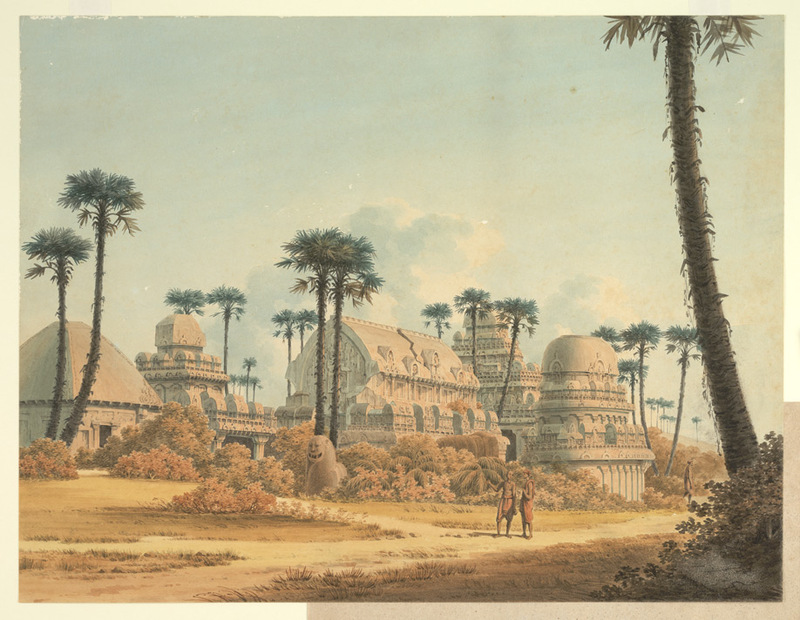 This notion of Seven Pagodas led to the theories that there once stood seven majestic temples in the town, and many of these were later encroached upon by the ocean. At present, there are two temples near the shore, located within the Shore Temple complex. The natives of the town say that there were five additional temples, which now lie submerged in the ocean. Few submerged remains have been brought into light during ocean archaeology conducted during this century. However these submerged structures are not in the tune of the five submerged temples. With these evidences at hand, it appears that the term Seven Pagodas was just a notional reference to the town with no real meaning behind. Mamallapuram reached to its zenith during the Pallava period of the seventh and eighth century CE when the town was catapult it into a major port and art center. Percy Brown1 writes, “Of all the great powers that together made the history of southern India, none had a more marked effect on the architecture of this region than the earliest of all, that of the Pallavas, whose productions provided the foundations of the Dravidian style.” The Pallavas constructed over a thirty monuments in a very short period of about hundred years. This rigorous construction activities and prospering sea trade community turned the town turned into a very prosperous city. Alas! It was not able to hold this position for long and soon the town turned into a small village of much lesser importance than its heydays. The Pallavas remain active in Mamallapuram till the first quarter of the eight century CE, till the reign of the Pallava king Rajasimha (700-728 CE). After the demise of Rajasimha, the Pallava power waned and all construction activities in the town were stopped. 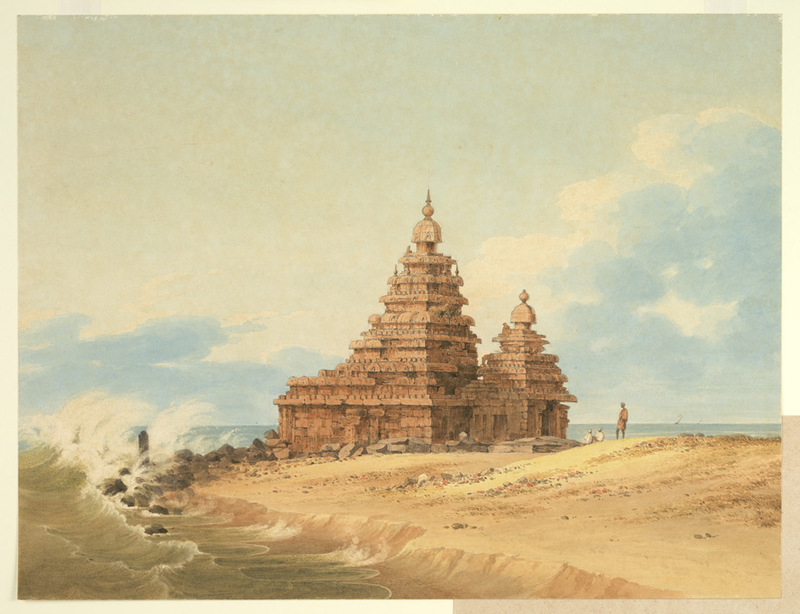 Once the Pallavas exited the scene, the temples of Mamallapuram continued getting royal patronage from the later Chola and Vijayanagara rulers. However, this patronage was limited to grants for the temples to continue their daily rituals. This patronage did not result in any new construction at a big scale. Mamallapuram would have continued enjoying the status of a divya Vaishnava tirtham and thus being visited by the pilgrims in large numbers. After the fall of the Vijayanagara, the town went into oblivion only to be discovered again in the last quarter of the eighteenth century. A question arises on the antiquity of the place. Was Mamallapuram founded by the Pallava kings or it was in existence before? 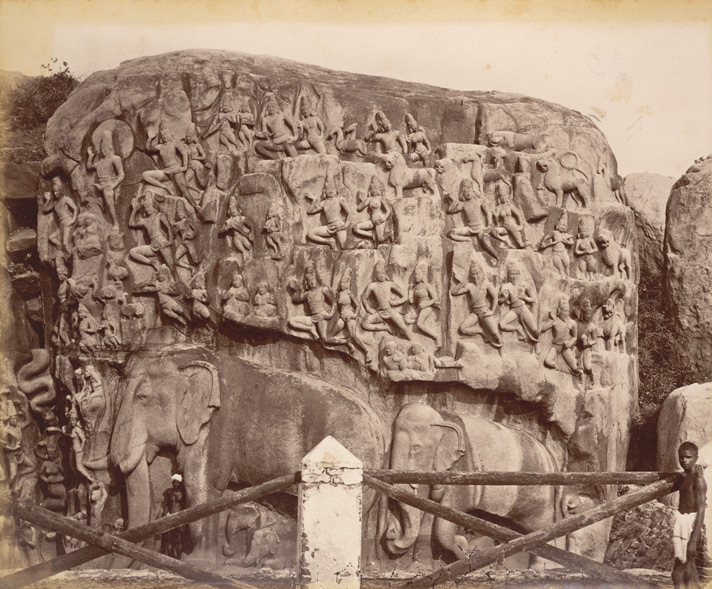 There are few abstract references, prior to the Pallava period, which may point in direction that Mamallapuram was in existence before the Pallavas. However, these references are not very clear and distinct therefore there is no definitive certainty. Among these references, the important ones are Sopatma of Periplus, Maliarpha and Melange of Ptolemy and Nirpeyar of Perumpanarruppatai. Based upon these references, it may be stated that there is a strong possibility that Mamallapuram would have existed before the Pallavas. However, it is certain that it was the Pallavas who brought it into prominence. If this is accepted then the theory that Mamallapuram was founded by the Pallava king Narasimhavarman Mamalla needs to be invalidated. In the modern times, the town reached its fame during the last quarter of the eighteenth century when various European visitors and travelers started frequenting the place. The early accounts of the town and its monuments, published in the last decade of the eighteenth century CE, made it popular among the curious lot. Its vicinity to Chennai, then Madras, made it an ideal sport for the Europeans to visit on a casual holiday. 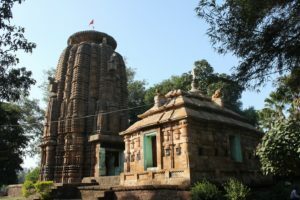 The monuments of the town were featured in the accounts of the early visitors of eighteenth and nineteenth century as they were surprised and bewildered to find such fine specimen of Indian art. Various theories about the authors and period were proposed and later tossed and modified, creating a mysterious mist around the town and its monuments. Though the town has few of its riddles still fresh and unresolved, however most of the primitive mysteries have been resolved. As the time progressed, more researches came into light, lifting the curtain from many of the riddles associated with the town and its monuments. Now we have fairly good knowledge on who were the builders, what they built and other similar topics. As mentioned above, the town came into prominence during the Pallava period of seventh and eighth century. It was these Pallava kings who excavated and constructed all the monuments of this town, within a span of short hundred years. We still do not have consensus on the individual authors of these monuments, and for the want of space, this topic is taken in another chapter of this article. After the rule of the Pallavas, the town received patronage from the later rulers, however not to the extent as during the Pallavas. All the construction activities were halted during the Pallava regime itself and no later ruler tried to reconvene the stopped work. This led us to another riddle, why suddenly all the monuments were left in incomplete state and no later ruler tried to complete a single one? For the want of space, this topic is also dealt in another chapter of this article. Once the town became famous in the scholarly and elite circles of the European scholars and travelers, it started being frequented by dignitaries and explorers. These travelers left their accounts of their visits and it bestowed a celebrity status to Mamallapuram. The extent of attention it garnered soon made it the most talked and discussed heritage site of India, competing with Ajanta, Ellora and Elephanta. Various scholarly articles and accounts clarified and lifted off curtains over the surrounding mysteries about the town and its monuments. 1984 brought a new heights to the monuments of Mamallapuram. By this time, our knowledge about the political and cultural aspects of the monuments was very much clear. The monuments of Mamallapuram were included in the World Heritage List by UNESCO in 1984. This puts the town on the world tourism map and provided much required impetus to conserve and protect these specimens. This inclusion in the coveted list allowed the local government bodies to ramp up the town and its connectivity to showcase it to the world tourists. Now, Mamallapuram is a bustling small town, decked up with high end hotels and restaurants and boasts superb connectivity to Chennai and other nearby big cities. It is a well-known and much frequented weekend destination. Tourists from all over the world come to witness the exquisite art panels and majestic temples. The town receives all with open embrace and cater to the needs to all kinds of visitors. 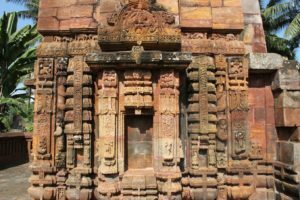 In the next chapters of the article, we will go deeper into the art and architecture of these monuments and also touch upon various mysteries surrounding the town.